The μ-Proteofection Kit VI, developed especially for proteofection, is a unique combination of μ-Slides VI from ibidi GmbH and PROTEOfectene® from Biontex. 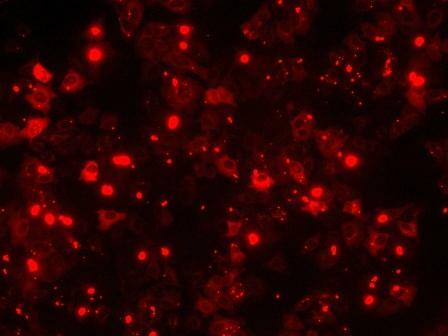 The high-performance kit enables living proteofected cells to be observed under high-resolution microscopy. In the ultra-simple protocol, adherent cells are treated in the μ-Slide with proteoplexes formed from PROTEOfectene® and a corresponding protein, and can subsequently be observed directly in excellent optical quality. Examples of applications include tracking the progress of a fluorescence-tagged protein through the cell from endocytosis to its place of action. PROTEOfectene® is used to introduce the fusion protein into the cell cytosol by means of proteofection. The nuclear localization sequence of the fusion protein is identified by importins and actively transported through the nuclear pores into the nucleus – a process that can be observed using fluorescence microscopy. Proteofection of HeLa cells with the protein GST-NLS-GFP and PROTEOfectene®; images clearly show the concentration of fluorescent protein in the cell nucleus adjacent to free proteoplexes and proteoplexes taken up by endocytosis (take-up 20 h after addition of proteoplex). An example of the efficiency of proteofection is the introduction of the fusion protein GST-NLS-GFP and subsequent nuclear transport of the active protein. It comprises three domains: GST (Glutathion-S-Transferase) is a tag domain serving to purify the protein after expression. NLS (Nuclear Localization Signal) is a short sequence of amino acids which serves to transport the entire protein through the nuclear pores. GFP (Green Fluorescent Protein) finally enables the process to be visualized thanks to its fluorescence in the green band of the electromagnetic spectrum. Most bright spots are cell fragments loaded with R-Phycoerythrin. 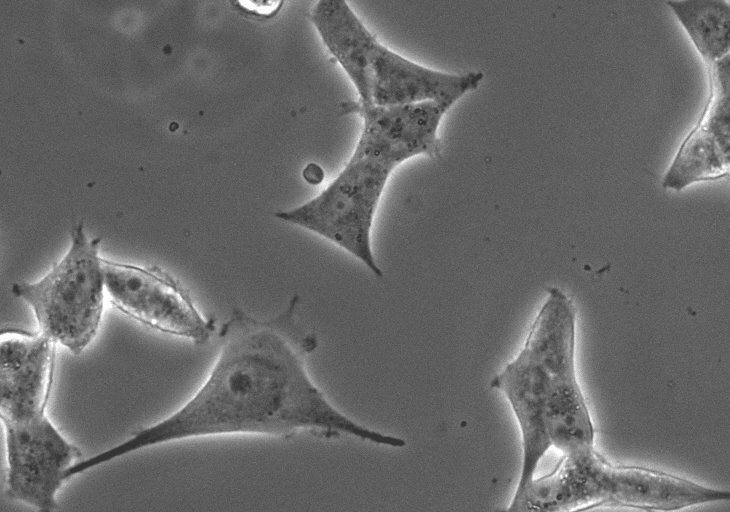 Note the fluorescent cytoplasmas and nonluminous cell nuclei. 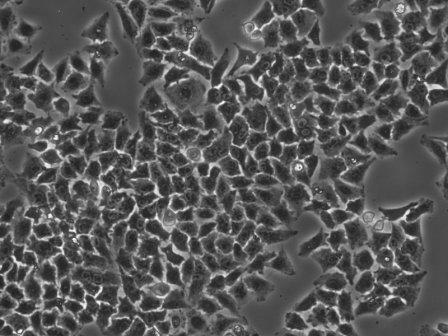 Proteofection of HeLa cells by using µ-Proteofection Kit VI. Pictures were recorded 24h after addition of the PROTEOfectene/GST-NLS-GFP complex. 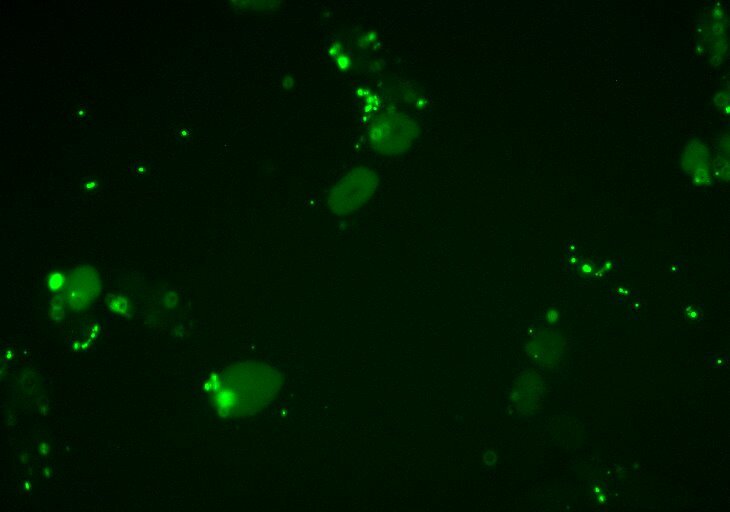 Move cursor over the picture for viewing the overlay picture: Cell nuclei have quantitatively imported the NLS-GFP protein.